The best thing which has originated from technological advancement is that people now connect on social media and comment and discuss about the foods and restaurants. Blog writing has also taken a shape with this advent and today food has become more appealing with digitization. People these prefer to order food, choose the best restaurants and the cuisine by simply downloading the mobile apps which are easily available. For the past few years restaurant owners were not much serious about the promotion food online but with more people present and available on social platforms and the wave of influencers that is blowing in the restaurant business has pushed restaurant owners to be more technological advance. Food industry is of course creating new things but having said that we need to incorporate latest technology into food manufacture and production and bring it to an exponential level. The technological advances have made an impact everywhere and one of the places we’re seeing more and more technology is in the restaurant industry. 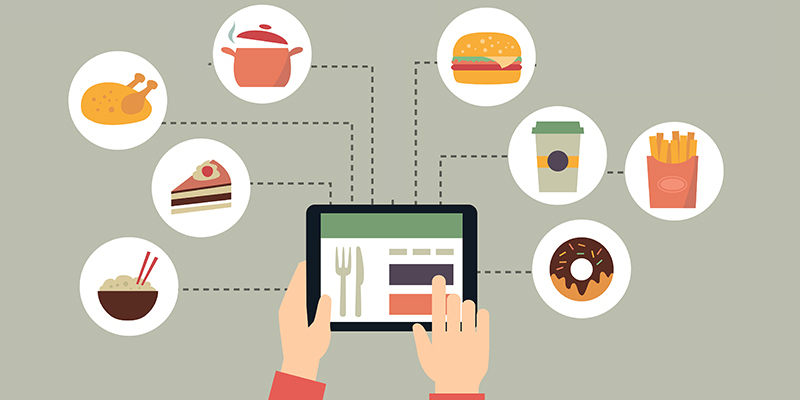 Restaurants are now acquiring technology in each and every step of their promotion. Creating a Face book page, a Twitter page, bringing in the loyalty programs like coupons and email alerts on birthdays and anniversaries, tying up with the online food ordering website are all an efficient manner to create profitability for one’s own restaurant. Touch screen Food Vendors and Vending Machines: Digital boxes of Ice cream which can produce variations of cool treats in seconds or the Coca-Cola's Freestyle soda fountain which has the potential to dispense more than 100 distinct beverages from one touch screen device are now an old age trend. People who are always on the go can grab quick bites and food of their choice at the vending machines and food counters available these days. Tablet Restaurant Management: The app which was created by a team of restaurateurs turned software makers in Newyork give the owners a quick check of their restaurants. India alone is home to ‘N’ numbers of such apps these days which provides quick guide on where to go, what to eat and what’s trending. LED Alert Systems: Kitchens can be loud and hectic and often staffed by people who speak different languages. And thus kitchen can be benefited from the illuminated alerts for example; the system alerts workers to time-sensitive tasks such as when the pots are washed or when silverware is dry and ready to be used. It can help maintain ambience in high-end eateries. “When I come back to India after my stint in global markets I asked the hotels if the kitchen was equipped with modern technologies, “shares Chef Sanjeev Kapoor who believes that it is impossible for a restaurant owner today to grow without the use of technology. Virtual Menu: Virtual menus with nutritional information have become an important aspect of a restaurant’s success. Allowing your customers access to each menu item’s calorie count, fat content and ingredients increase the level of trust and transparency between customer and provider. Nowadays, all the restaurants offer ‘virtual menu’, an advance tech-menu which is available on the restaurant website and can be viewed tablets or, palmtops, smart phones where the customer can go in full details about each dish of menu card. For example, the recipe, method of preparation, calorie contents etc. The trend has influenced the restaurant business largely by bringing an experienced and influenced customer. And, hence if you have a right kind of process then the business is bound to expand. Restaurants these days are implementing Airline Control Programme (ACP) to streamline the entire sourcing, selling and indenting. Customers want things to be in control these days and feel that they should be allowed enough information to make informed meal decision.